The Congressional baseball game seems to be the only time we see reasonable behavior from Congress. This fun tradition gives us a glimpse at the normally missing humanity and civility that we’ve come to assume does not exist in Congress. Rand Paul calls the Congressional baseball game a “great way to come together and do something fun that’s not too serious”, even as observers used the opportunity to heckle and jeer opposing political factions. And really that’s a sad state of affairs. Democrats are currently behaving like petulant children as they stage a sit in over the lack of any of their pet anti civil rights gun control bills passing. Although unlike the last time a group of crazy people occupied a Federal building, the Dems didn’t have to beg for their supporters to send them snacks. Not that the GOP is doing much better. Aside from a few outliers like Senator Paul, the GOP is big government as usual as they push warrantless data monitoring, and settle in for a long, heated battle to November. One would think a charity baseball game would at least bring out the civility of people watching but it doesn’t. Americans seem as bitterly divided over politics as ever, and can’t even relax long enough for a baseball game. 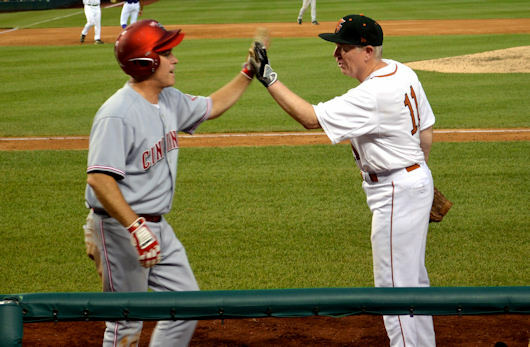 Look folks, if Congress can figure out how to be civil long enough to play baseball, so can everyone else. Really, there is nothing more American than an early summer baseball game, and the fact that we actually have a pretty damned good political system where some of the most powerful elected people in the nation can enjoy just playing ball for an afternoon. I can think of few things that should bring Americans together more than an simple amateur baseball game. Instead, our bitter emotions have divided us everywhere we go. The Congressional baseball game should be a time for everyone to smile, enjoy the sunshine, have a cool beverage and hotdog, and just relax. If our Congress can come together to play a spirited game of baseball, then we as a people should be able to come together long enough to realize that the world isn’t so bad, that life goes on, and to take Senator Paul’s words about coming together and having fun to heart. Smile. And let’s play ball! Do we need more Congressional ballgames and fewer Congressional sit-ins? Share your thoughts on Facebook and and Twitter. ← Why Does The GOP Support Warrantless FBI Searches Of Internet Activity?